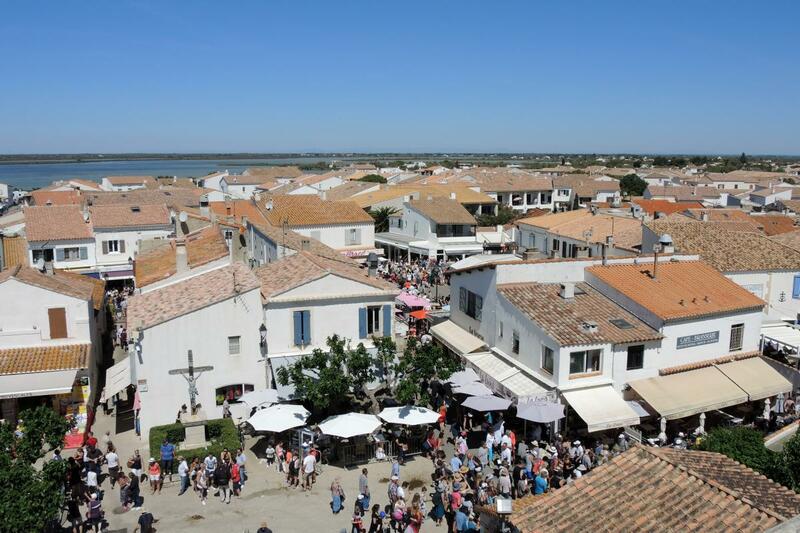 Saintes-Maries-de-la-Mer, an ancient town in the marshes of the Camargue, where the Rhône River meets the Mediterranean Sea, is named for two Marys — in French, Ste. Marie Jacobé and Ste. Marie Salomé — who are closely linked to Jesus in the gospels.1 The designation “de-la-mer” (of the sea) derives from a medieval tradition that after Jesus’ death the two Marys traveled across the sea by boat and lived in the Camargue the rest of their lives, helping to bring Christianity to France. Today, aside from being a working class summer beach destination with a picturesque Romanesque fortress-church, Saintes-Maries-de-la-Mer is known in France for the celebrations it holds for each Mary’s feast, in May and October.2 The feast days in May draw large numbers of Gypsy Catholics and others from France and beyond — typically 25,000-40,000 people all together — to the town for a week. 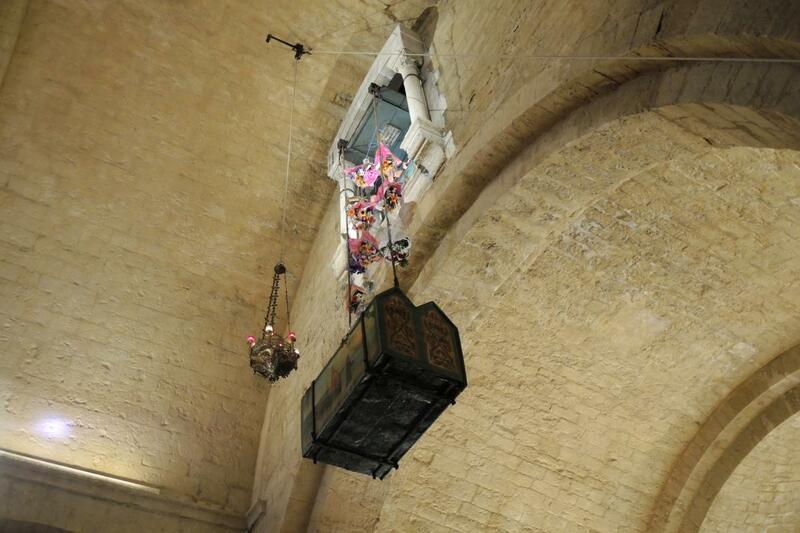 The high points at that feast include a ritual when a painted reliquary chest, said to contain the bones of the Saintes Maries, is ceremoniously lowered from its high perch to the altar for veneration, and when the crypt is left open so that the statue of another figure, the Gypsies’ own Ste. Sara, can be honored. 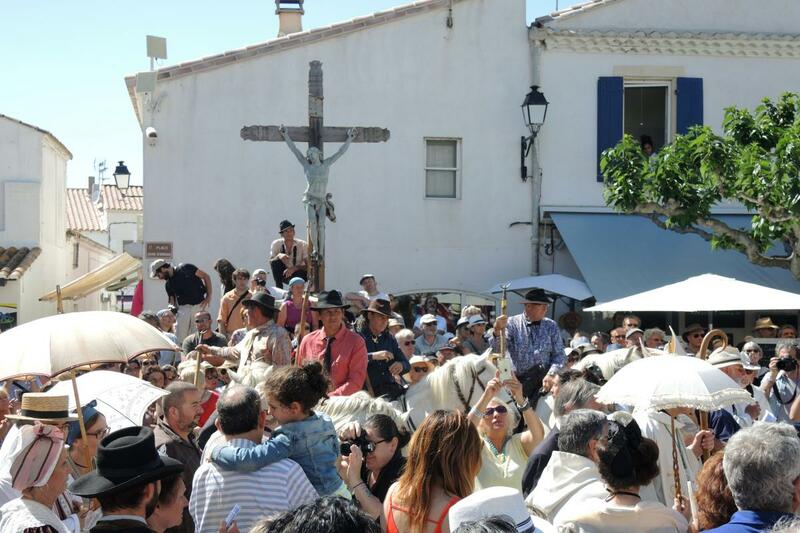 On successive days, Gypsies, Santois (as the local townspeople are known) and a large crowd from the Camargue region and the rest of France process statues of Sara and the Saintes Maries from the church to the beach, carrying them right into the sea, then back to the church. 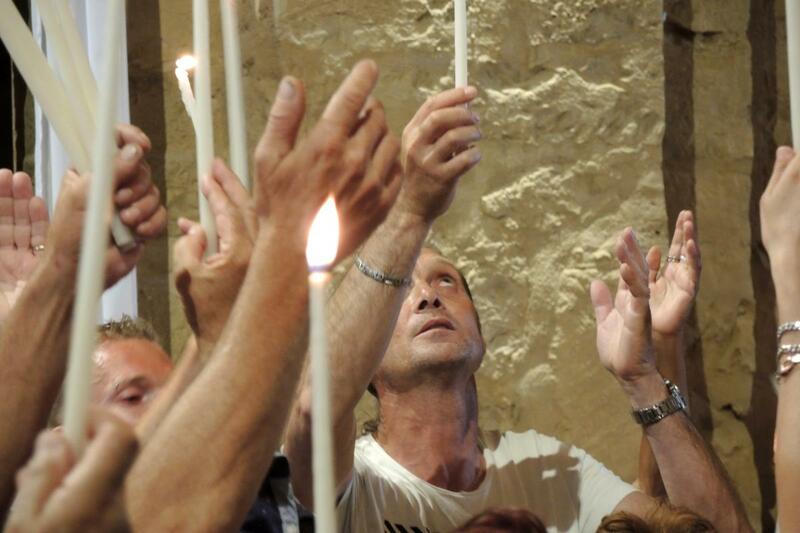 Though Sara is not canonically recognized by the Church, many in the Catholic Gypsy or Gens du Voyage (Gitan, Rom, Manouche, Tsigane) community believe that Sara is integral to the story of the Saintes Maries.3 Gypsies come here to pray and to celebrate the Marys and Sara, and the feast is an occasion for family reunions, baptisms and weddings. They regard Sara as their patroness, treat her with tremendous devotion, and come here to manifest that. For them, this feast is a religious highlight of the year. 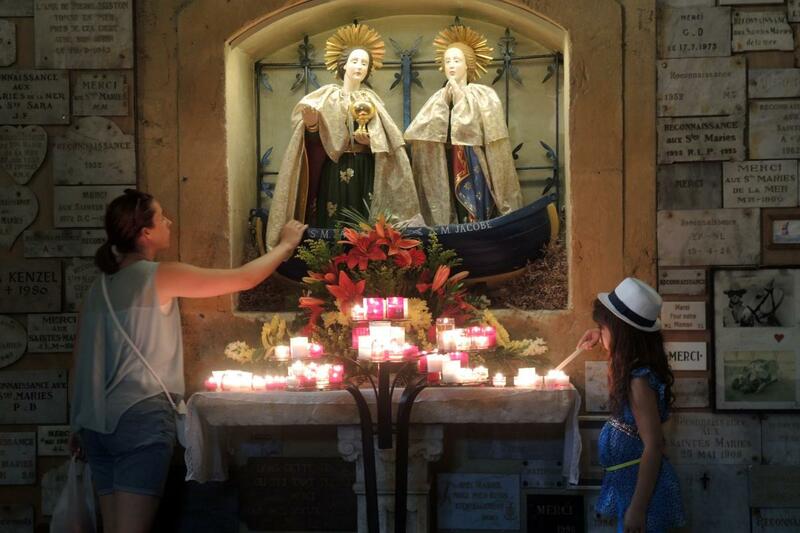 That parts of the story are a matter of tradition rather than verifiable history hardly seems to diminish the delight that pilgrims and parishioners take in celebrating these women. 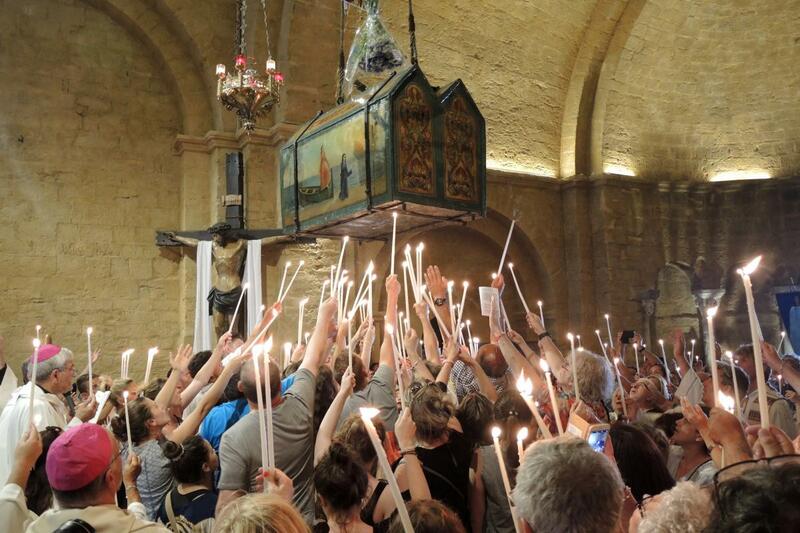 Locals celebrate that this is the place where the Saintes Maries, witnesses at the foot of the Cross and the Resurrection, are celebrated and raised up. Others celebrate that two women so important to Jesus, but largely ignored in Catholic devotion, are acknowledged. 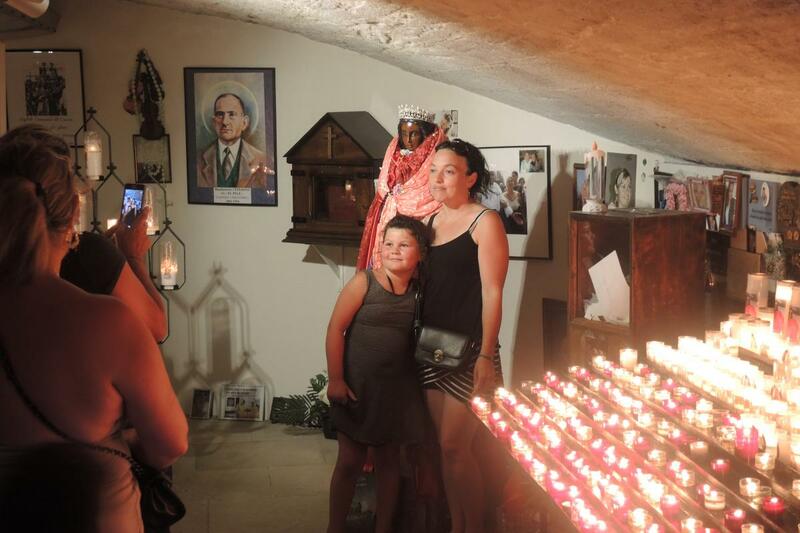 The Gypsy community celebrates a figure who may be regarded by some as an outsider, but is, they say, real, powerful and integral to the story of Catholic France. Sara’s story is even more obscure. Depending on who tells the story, she either came with the two Marys as their servant, or as their equal, or even preceded them and greeted them when they arrived. By one telling, she was one of Pilate’s wives, an Egyptian who on witnessing the events of Jesus’ Passion, converted to Christianity, traveled on the boat with the two Marys, and evangelized the Gypsy people. In another telling, she was the chief of a dark skinned people who originally inhabited in the Camargue, greeted the Marys when they landed, and asked to be baptised. After 1900, the cult of Sara was publicly transformed, even while the archbishop of Aix-en-Provence and Arles was a regular participant.12 Her statue, with brown skin, appeared in the crypt, though no one took credit for putting it there. From 1935 onwards, Gypsies reenacted that account. 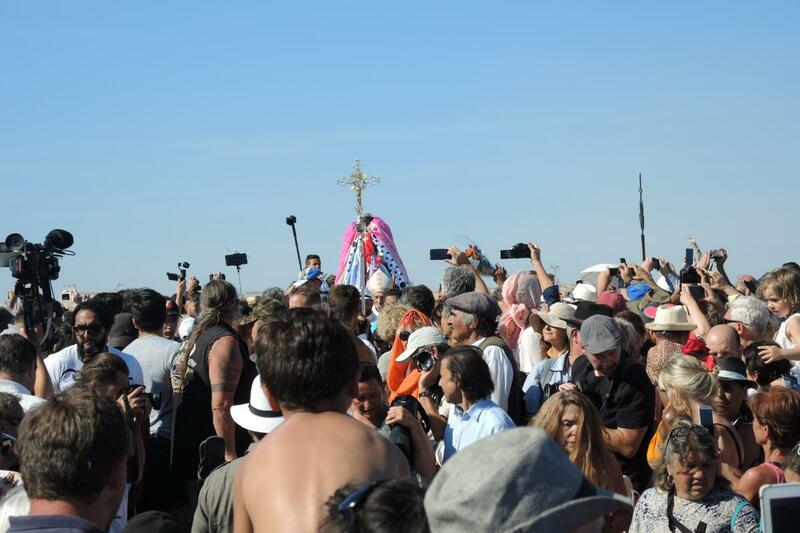 On May 24, the day before the Saintes Maries procession, Gypsies carried Sara’s statue from the church to the sea in a special procession to greet them. 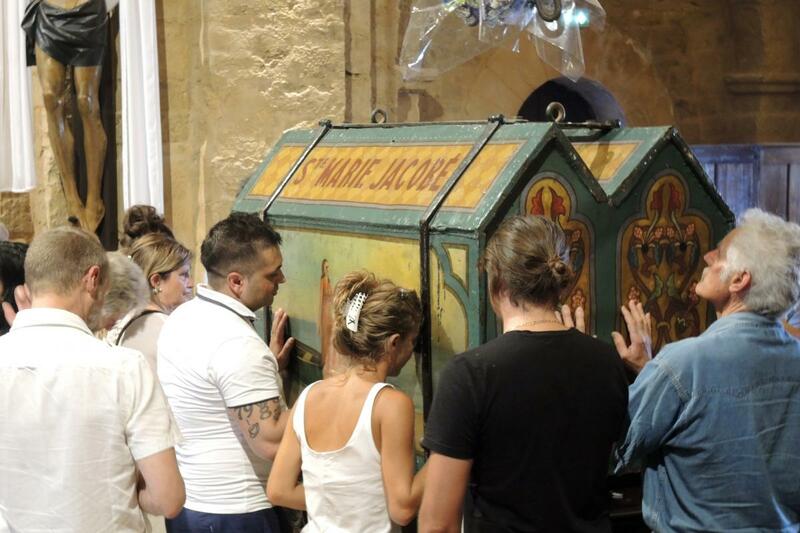 The archbishop did not prevent the procession, but he and the clergy did not participate.14 Gypsies were given a certain pride of place in the other ceremonies, even the chance to be the first to touch the reliquary chest of the Saintes Maries when it was lowered. 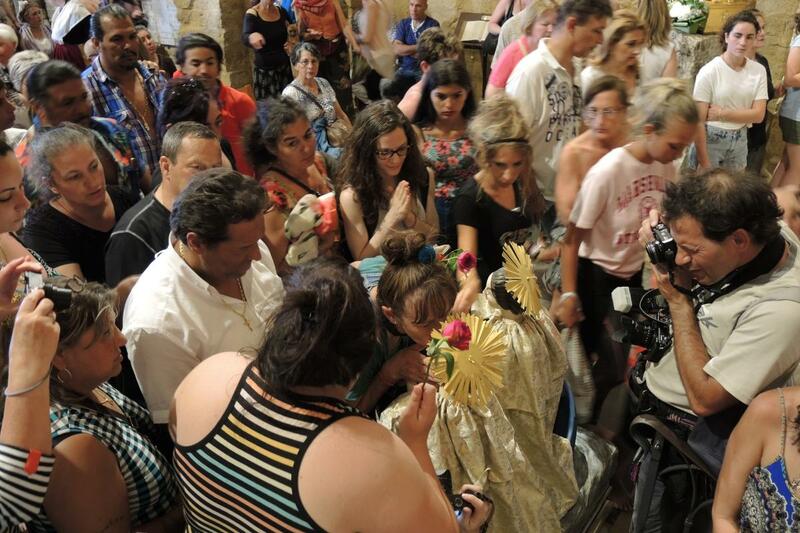 The role of devotions like these came under fire in light of the theological changes of Vatican II, and clergy tried to substitute a Way of the Cross for the procession of Sara.16 Fierce opposition ensued, so much so that any effort to displace Sara was abandoned. In 1967, Msgr. Provenchères, Archbishop of Aix-en-Provence, gave his approval to the procession of Ste. Sara, in light of “immemorial” tradition: “Like many other saints, it is not possible to give precise historical details about the character of Saint Sara.” But that, he said, was a problem for historians to solve and clarify, not the bishop.17 In the years that followed, the procession began to draw beyond its local Gypsy communities, attracting Gens du Voyage from France and beyond. 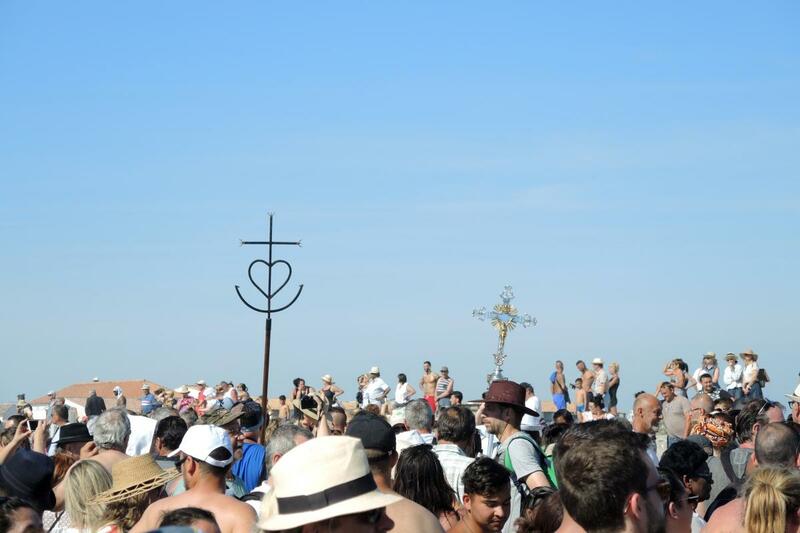 Ellen Badone, “Pilgrimage, Tourism and the da Vinci Code at Les-Saintes-Maries-De-La-Mer, France,” Culture and Religion, v. 9 no 1, March 2008, 22-44. 1. In English scriptural translations, they are often known as Mary the mother of James, and Salome. 2. Ste. 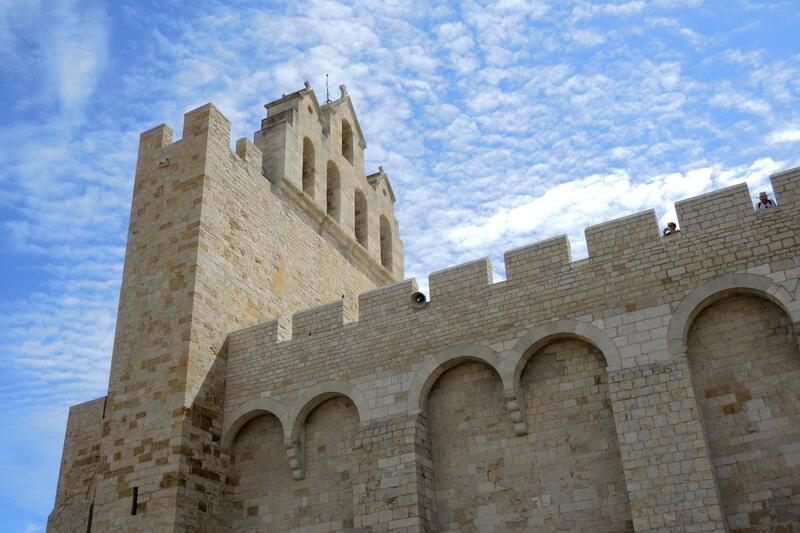 Marie Jacobé’s feast is celebrated here May 25; Ste. Marie Salome’s feast is celebrated on the third Sunday of October. The Gypsy/Gens du Voyage community tends not to attend in significant numbers in October, and Ste. Sara is part of the celebration only in May. The church also celebrates a smaller, more local feast in early December to mark the anniversary of the reliquary’s placement above the altar. 3. Use of the term Gypsy (Gitan in French) is somewhat fraught, because of a long history of discrimination against these peoples. In the European Union, the preferred terms are Roma or Romani (Roms in French). The term Gypsy is used here because that was the more frequently used term among interviewees, who actually come from a number of communities, including Gitans, Sinti, Roms, Manouches and Tsiganes. More precisely, Gitans (Gypsies) was as close as most came to having a preferred term. A number were uncomfortable using a name like Roms (Roma) assigned by elites. During the feast, organizers and signage referred to them as Gens du Voyage, “traveling peoples,” though that too is a term with legal connotations that may not entirely fit. It technically includes people who are not Rom. Moreover, while many of the people who came in camping trailers to join the feast are said not to be travelers in the French legal sense — people who travel in campers from place to place. Rather, they were people who ethnically identify as Gitans or Manouches, but live at a fixed address and use a camping trailer to travel to events like these. 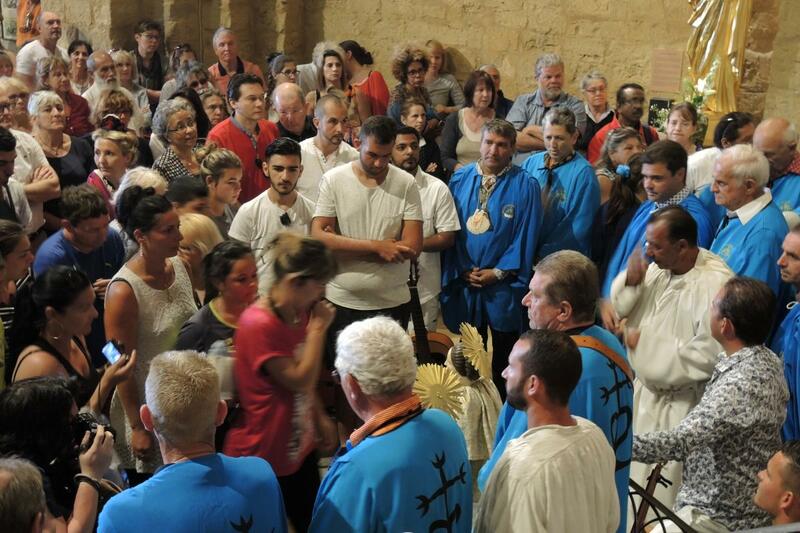 The diocesan organization in the Camargue does use the phrase Gens du Voyage. Its name translates as “Catholic Movement of Gypsies and Traveling Peoples.” For a commentary in French on the issues and complexities of naming among the Gens du Voyages, and the variety of cultures subordinated under that larger (and largely elite-defined) umbrella, see anthropologist Marc Bordigoni's Gitans, Tiganes, Roms: idées reçuessu le monde do Voyage (Paris, Le Cavalier Bleu: 2013), 17-24. 4. The passion narratives in Mark, Matthew, Luke and John differ on which of the Marys were present and how they are named. The oldest gospel, Mark, explicitly places Mary Magdalene, Mary Salome and Mary Jacobé at the Cross and the empty tomb. Luke does not name them, but tells the same story about the women: “the women who had followed him from Galilee,” who were present at the crucifixion, prepared to anoint him, and reported to the apostles that he had risen (Lk 23:49, 55-56). John 19:25, names among the women at the crucifixion “[Jesus’] mother’s sister, Mary the wife of Clopas” which would make Marie Jacobé Jesus’ aunt. Some traditions suggest that Marie Salome was also an aunt to Jesus, sister-in-law of St. Joseph. To compare accounts, see Mk 15:40-16:8, Mt 27:55-28:10, Lk 23:49-24:12 and Jn 19:25-20:18. 5. 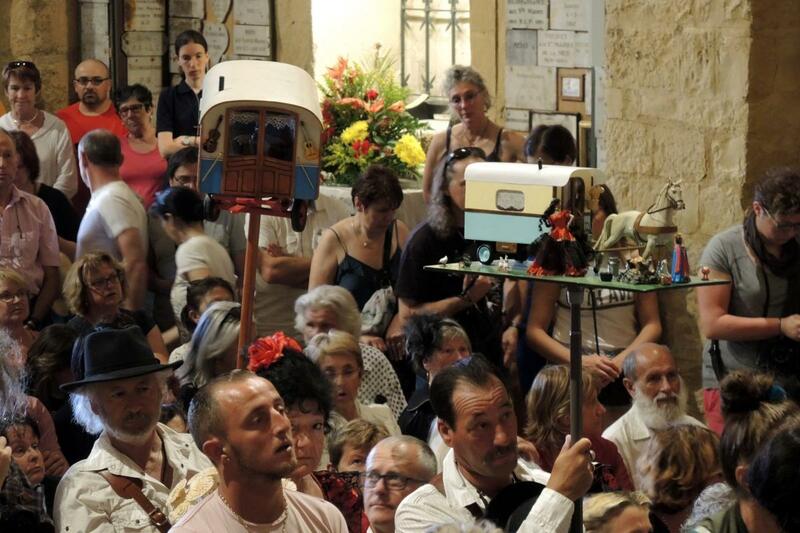 The history of the feast cited here is drawn from Sophie Bergaglio, L’Histoire du Pèlerinage des Saintes-Maries-de-la-Mer, Aix-en-Provence: Édition des Lilas, 2016. 8. Bergaglio, 87, 88. Original accounts of the discovery of the bones do not mention this. Written accounts of Sara before the French Revolution do not link her to the Gypsies. 10. Bergaglio, 100-116. Author’s translation. 11. From medieval times “Gypsy” peoples in Europe were often said to have migrated from a place called Little Egypt. The word “Gypsy” derives directly from that association. 12. Marc Bordigoni, “Le ‘Pèlerinage des Gitans’: Entre Foi, Tradition et Tourisme,” Ethnologie Française XXXII, 2002, no. 3, 490. 13. For a fuller account in English of Baroncelli’s role in shaping the rituals of the modern feast, and his curious theories about human anthropology, see Ellen Badone, “Pilgrimage, Tourism and the da Vinci Code at Les-Saintes-Maries-De-La-Mer, France,” Culture and Religion 9:1, March 2008, 26-28. 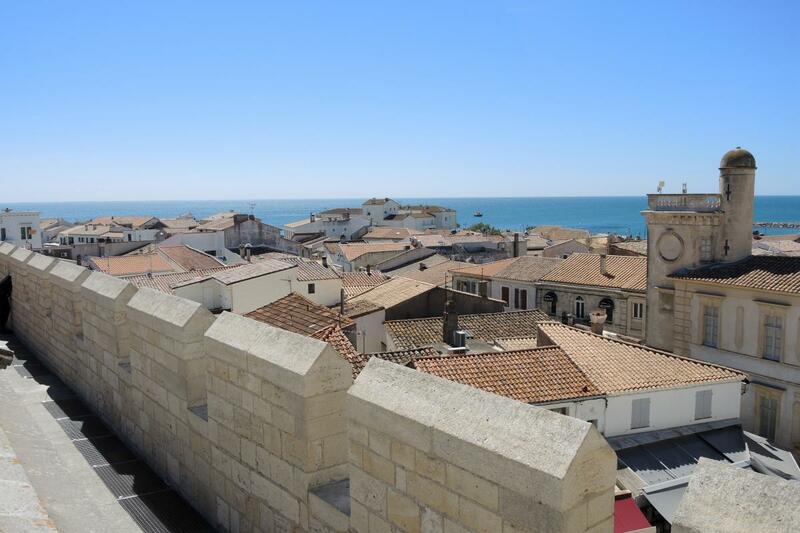 The feast for the Saintes Maries, two women who, according to medieval tradition, traveled across the sea to France following Jesus' death, features veneration of a reliquary believed to hold their bones, and procession of their images to the sea. 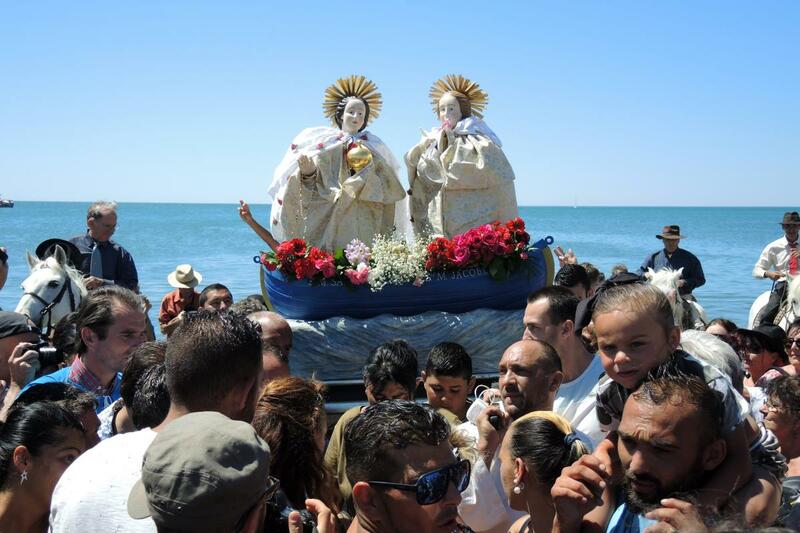 A procession is also held for Sainte Sara, and unofficial saint of Gypsy Catholics who pilgrimage to the ancient seaside town for the feast.